Didier Drogba is determined to quit Chelsea next month. 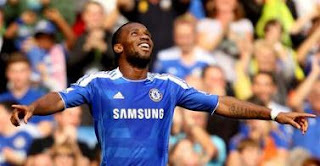 Drogba, 33, is furious the club have rejected his demands for a new two-year contract. And he has resolved to make a lucrative move to China in the January transfer window rather than wait until his contract expires next summer. The Ivory Coast international has been offered a two-year deal by Chinese club Dalian Aerbin worth £200,000 per week while Chelsea are only prepared to give him 12 months at £125,000 a week. That means Drogba can earn £20m in China or £6.5m at the Bridge.